This is 5.56 Federal / Lake City XM193J 55gr. Full Metal Jacket Ammo on Stripper Clips. This ammo was manufactured by the Lake City Army Ammunition Plant and is headstamped LC 10. This ammo is manufactured to U.S. Military M-193 Spec's. This ammo is brass cased, boxer primed and 100% non-corrosive. 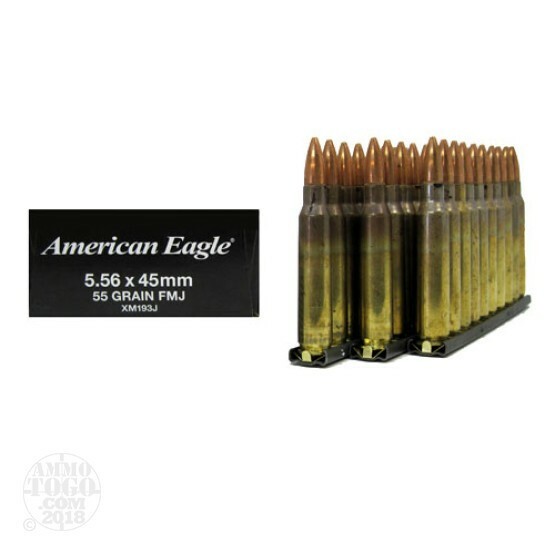 This is considered to be the best 5.56 55gr. FMJ ammo in the world. Muzzle velocity of 3165fps. This ammo is packed on 10rd. stripper clips, 30rds. per box, 900rds per case.